Ossetians - .OSSETIANS AT THE 2008 OLYMPICS IN BEIJING. .OSSETIANS AT THE 2008 OLYMPICS IN BEIJING. Amateur wrestling is sport #1 for Ossetians, a small nation settled within Caucasus mountainous region, which is partly located within Russian Federation. There are many prominent and talanted ethnic Ossetian wrestlers currently live in North and South parts of this region. And since the Russian National team can not hold everyone of them , many prefer to get the second citizenship and represent other countries, rather than being cut off the World and Olympic tournaments, though they still mainly live and practice in Vladikavkaz (Ossetia). At the XXIX Olympic Games in Beijing Ossetian sportsmen won two gold, three silver, and four bronze medals. The performance of Ossetian sportsmen was quite good. However, the results from the 2004 Olympic Games were much better: four gold, two silver and one bronze medals. Twenty Ossetian sportsmen performed at the 2008 Olympics and won medals for Russia, Uzbekistan, Kazakhstan, Azerbaijan and Slovakia. The most successful performance was that of wrestler Artur Taymazov, who became two time Olympic Champion as part of Uzbekistan’s team. He is the fourth ethnic Ossetian athlete who won the Olympic gold twice. Artur Taymazov - two time Olympic Champion. Foil fencer Aida Shanaeva (coach Fiala Kadzova) became the only Olympic champion in team competition (for Russian National Team). This represents the first gold Olympic success of Ossetian school of fencing. Khasan Baroev failed to defend his Olympic Champion status in Graeco-Roman wrestling in the final round. He lost the match to Mikhail Lopes from Cuba in 120 kilos weight category. Baroev ended up with silver medal in Beijing after winning gold medal in Athens. Olympic medals were also expected from Svetlana Tsarukaeva (weightlifting) and Tamerlan Tmenov (judo). Tsarukaeva (coach Kazbek Zoloev) was not able to raise the initial requested weight and dropped out of the fight for the medals. Tamerlan Tmenov (coach Alik Bekuzarov), who is the Russian judo team’s captain and two time Olympic silver medalist, lost to Olympic champion to come Ishii from Japan and was also left without a medal. The main expectations were related to the wrestlers’ performance, mainly Besik Kuduhov’s, Irbek Farniev’s and Georgy Ketoev’s. Unfortunately none of them could make it to the finals. World Champion Besik Kuduhov (coach Valentin Gozoev) was the favorite in 55 kg weight category. However in semifinals he unexpectedly lost to Japanese Tomohiro Macunage (3:0, 1:0). When wrestling for the third place, however, he confidently won over Dilshod Mansurov, two time World champion from Uzbekistan (1:0, 2:0). The alumni of Artur Kaloev and Adabe Bekoev and the 2005 World Champion Irbek Farniev (66 kilos) lost in quarterfinals to Kazakh Leonid Spiridonov and dropped out of the fight for the medals. Ossetian Albert Batyrov (for Belorussiya) was wrestling in the same weight category, but lost in the beginning of the competitions. World and European Champion in the 84 kg weight class Georgy Ketoev also was the main contender for the Olympic champion title. In the first round, he won Chinese Yin Wang (2:1 by periods); then Ketoev confidently won (4:1, 5:1) his fellow Ossetian Zaurbek Sokhiev (represented Uzbekistan), who in his turn beat another Ossetian Gennadiy Laliev, representing Kazakhstan, in a very tense match. In quarter-finals, Ketoev won Azerbaijani Novruz Temrezov (0:4, 2:0, 2:0) but then in semi-finals lost to Georgian Revazi Mindorashvili (2:4, 3:7). In the match for third place coach Marik Tedeev’s alumnus won David Bichinashvili from Germany (3:0, 0:2, 2:2). Two Ossetian wrestlers, Soslan Tigiev (Uzbekistan) and Ibragim Aldatov (Ukraine), struggled for the Olympic medals in the 74 kg weight category. Initially Aldatov, who is the 2006 World champion, was considered to be one of the Buvaysar Saytiev’s main rivals. However, in 1/8 finals he lost to Arsen Gitinov from Kirgiziya (1:2). But Soslan Tigiev (Uzbekistan) reached the finals and showed decent resistance to Buvaysar Saytiev. A wrestler from Vladikavkaz who was practicing under the supervision of Kazbek Dedegkaev and Yuriy Kishiev, didn’t efface himself in the face of the eminent rival and fought head-to-head during the whole match and even led after the first period. Having lost with decency to tree time Olympic champion, Soslan Tigiev won Olympic silver. This was undoubtedly a big achievement for him. There were three Ossetian wrestlers in the semi-heavy weight (96kg) category – Taymuraz Tigiev (Kazakhstan), Khetag Gozyumov (Azerbaijan) and Georgy Tibilov (Ukraine). All of them demonstrated a very high level of wrestling. For example, in 1/8 finals Tibilov wrestled the oncoming Olympic champion, Russian Shirvani Muradov, and was very close to the victory. In semi-finals Muradov competed with another Ossetian wrestler Khetag Gozyumov, (represented Azerbaijan, coach Marik Tedeev), who has been his long-standing rival. The Azerbaijani sportsman won the first period, but later Muradov managed to change the course of the fight. In another semi-finals, Taymuraz Tigiev won George Gorgshelidze, a very strong Georgian wrestler. Gozyumov and Tibilov met in the match for the third place. Azerbaijan’s representative confidently won in two periods – 5:0, 2:0 – and became the bronze winner of the Games. The final match in this weight category between Dagestany Shirvani Muradov (Russia) and Ossetian Taymuraz Tigiev (Kazakhstan) has gone through in a head-to-head, tense struggle. Russian was able to win two periods with a minimal score of 1:0 and win the gold medal. In the heavy weight category (to 120 kg.) the contest between friends, both Olympic Champions and multiple World Champions, delegates of Ossetian wrestling school, Artur Taymazov (Uzbekistan) and David Musulbes (Slovakia) became the main intrigue of the tournament. Both of the Ossetian wrestlers were aiming for the new championship. However, they had to meet in semi-finals. Their fight was equal and tough – none of them wanted to yield. Nevertheless, Taymazov turned out to be stronger and won in two periods – 1:0, 1:0. In the bronze medal match Musulbes confidently won Cuban Disney Rodriguez (4:0 and 4:2). David Musulbes, who returned to sports after a 4-year long retirement, performed very successfully. A bronze medal is undoubtedly a decent conclusion to the sports career of the outstanding wrestler, an alumnus of coaches Saveliy Byazrov and Kazbek Dedegkaev. The championship of Artur Taymazov, who’s being trained by Kazbek Dedegkaev and Hasan Apaev became the main Olympic achievement of the Ossetian wrestling school. 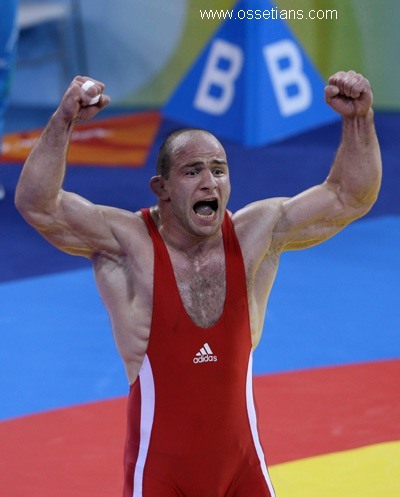 He left no chance to Russian Bahtiyar Ahmedov in the finals (3:0 and 1:0) and added a gold medal in Beijing to the gold from Athens-2004 and silver from Olympic Games-2000. Russia got the biggest number of medals in the Olympic wrestling tournament– three gold, one silver and two bronze medals. Uzbekistan was in the second place with one gold and one silver medal. Georgia got one gold and two bronze medals.